Here’s the famous theme “Temple” from Super Smash Bros. Melee (2000). It’s an incredibly catchy tune originally from Zelda II: The Adventure of Link (1987) that was remembered and invigorated by the wonderful Melee version. The Melee remix was composed by Hirokazu Ando of HAL (Kirby’s All Star, Kirby and the Amazing Mirror). The original was composed by Akito Nakatsuka (Ice Climber, Wario Land: Shake It!). The track is also known as “Palace” or “Shrine”. Melee‘s version of the theme has a very cool opening with acoustic guitar. It’s only about ten seconds long, but the whirling notes and wind sfx provide a wonderful call to adventure, oozing the feel of the shadowy mouth of a dungeon. This underlining loop is repeated and layered throughout the piece like the unraveling of Ariadne’s thread in the labyrinth and the echoes of footsteps on the eerie stone walls. The piece goes into full swing with a sweeping string section that is punctuated by percussion blasts like whip cracks. The instrument selection feels very much in concord with Link to the Past and Ocarina of Time, particularly the flute line. Ando also adds a nice choral section about halfway through to crank up the intensity and show those Darknuts who’s boss. It’s very interesting that this piece was used in Melee instead of a more traditional Zelda theme – most people had forgotten Zelda II by this point – the game simply didn’t hold up to the other titles in the series. The piece probably returns because Mr. Nakatsuka was working with HAL on Melee. Read the rest of this entry ? As the year draws to a close, I wanted to pull a few of my favorite ending themes. Legend of Zelda: A Link to the Past (1991) is a good place to start, and it is also one of my favorite game endings. The entire ending sequence (not counting the Triforce Chamber), lasts 7:44, and it has some nice cutscenes showing all the places the player has traveled and all the people he helped as well as some wonderful music. 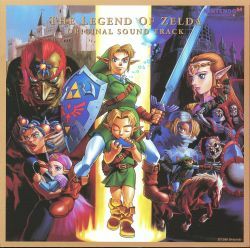 This medley of the “Ending” and “Credits” themes comes from Legend of Zelda: Sound and Drama (1994), another rare album. This song is actually a combination of the ending and credits themes from Legend of Zelda: A Link to the Past. The track begins with the “Triforce Collect SFX” that plays at the end of the Triforce room sequence. The “Ending” theme then plays accompanying a long cutscene showing how Link has brought peace to the kingdom of Hyrule through his heroism. All the evil has fled and the world is back to normal (or about as normal as Hyrule can ever be!). The theme gives a nice sense of flying over the rolling hills, forests, and mountains of Hyrule as a nice victory march. A rupee-esque harp is even played for good emphasis (1:12). 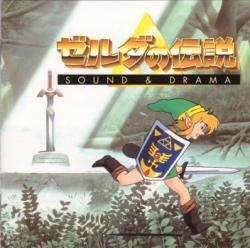 Many of the different scenes have their own variations of the main theme, such as the ocarina player in the forest (2:10), who is shown playing in the grove to all the animals as a more dance-like movement driven by strings begins. The end sequence with strong trumpets coming to a crescendo is where Link returns the Master Sword to its place of rest, deep in the forest. In all the track has some nice variations, and is a pleasure to listen to. Next plays the “Credits” theme, which is one of the most beautiful vgm pieces. 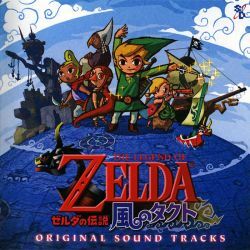 It is an arrangement of the Zelda “Overworld” theme, played softly with strings (violins and cellos), then adds a flute. Read the rest of this entry ?